Newer limited-edition collectibles, such as scale models by Corgi and porcelain plates, look great in Sorbo’s display case. owner of Strawberry Fields Design Inc. is featured in Antique Week, October 2008 issue. February 1964. Forty-five years ago, four young Liverpudlians crossed the pond to the United States, and music – and the world – was never the same. Addie Sorbo wasn’t even born yet, but that didn’t stop her from acquiring a lifelong passion for, and collection of, The Beatles. Inspired by her father’s love of music, the Green Bay, Wis., collector has found an affinity with her favorite musical group—so much so that she even named her graphic design firm Strawberry Fields Design. That name honors not only her love of the Liverpool lads, but also of her fondness for the 1980s character Strawberry Shortcake. “I just always liked their [Beatles] look and the whole Beatles brand,” said Sorbo, who is married and has two small children. 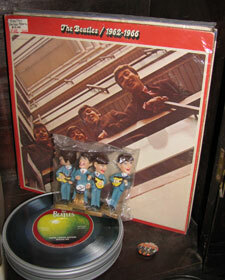 “It’s a passion of mine,” she said from her home office, which has become somewhat of a Beatles shrine—neatly organized on shelves and walls amid office equipment and her children’s toys. 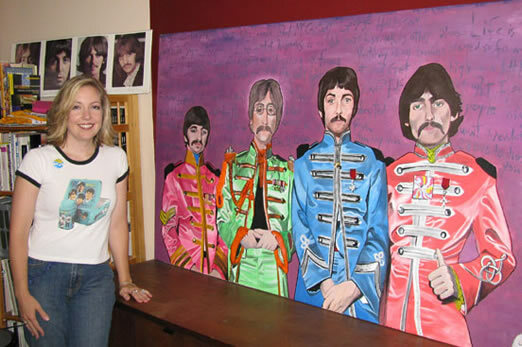 The centerpiece of her office is a massive brilliantly colored canvas of John Lennon, Paul McCartney, George Harrison and Ringo Starr, dressed in outfits from the Sgt. Pepper album (below). Sorbo painted the piece in high school; it now rests on a desk, the quartet somewhat keeping watch over her at work. It is Strawberry Fields after all, right? While Sorbo didn’t grow up listening to the Beatles in their heyday, she said, “My dad really got me into the 1960s bands. We listened to the oldies station.” By eighth grade, she was collecting just about anything she could get her hands on, from records and magazines to photographs and bubble gum cards. When she got married, the Beatles’ ballad “Here, There and Everywhere” was played, and she also has lyrics from “Strawberry Fields Forever” stenciled on her basement steps (“Let me take you down…”). 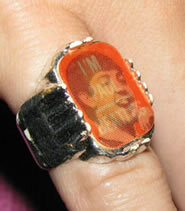 Sorbo acquired her collection mainly through purchasing items at antique shops and through fan magazines. “I like one-of-a-kind things,” she said, pointing out harder to find pieces like a vintage Beatles flicker ring or little plastic bobble heads of the band. Another curious one-of-a-kind item? The Beatles tattoo on her ankle – a subtle recognition of her fondness for the group. “I’m happy with my collection,” Sorbo said, estimating she has hundreds of items, some on display, some still boxed up. Among her favorite pieces of memorabilia is a signed black-and-white photograph of McCartney, which proudly hangs above her desk. “Paul McCartney has always been my favorite,” said Sorbo, who has seen him in concert three times – once from the first row. Having two small children has changed her priorities a bit – she no longer actively collects as much as she used to. 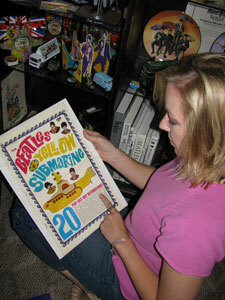 But friends and family still recognize her passion and often gift her with Beatles items. One item she’s still searching for? A coveted metal Yellow Submarine lunch box – a rarity in top condition (One sold on eBay in late 2008 for more than $680). And to most collectors, “things” are an important part of collecting. For Sorbo, however, the lyrics and music of the Beatles continue to be the main draw. That’s probably true for many Beatles fans. “For the Baby Boomers, it was such a big part of them,” Sorbo said. 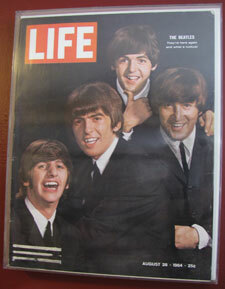 This 1964 Life magazine cover is a treasured item. “I just love their music,” she said. 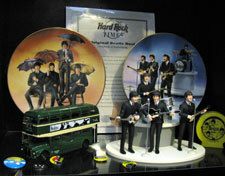 “Every single musician and band since them has been influenced by them. This massive and very colorful painting, which Sorbo painted in high school, depicts the Fab Four in Sgt. Pepper attire. ©Antique Week. Used with permission.